Monte Vista Elementary School students in Mr. Robert Regan’s third grade class held an open house last Friday featuring tiny homes they designed and built from the ground up. Mr. Kevin Hall, a local real estate agent and former Monte Vista Parent, came and spoke with students about real estate. They learned how to sell a home through communication and presentation. Students created business cards and signs to help market their tiny home. The tiny home models featured unique designs such as a diving board on the roof, a movable platform bed to save space and outdoor sleeping areas to be able to sleep under the stars. Many tiny homes came with ocean views and one was even located in South Africa (but could be moved anywhere as it was mobile). Many prospective buyers (parents), school admin, teachers, and students showed up to view the tiny homes for sale, which ranged in price from $30,000 to just over a million. With home prices ever increasing, the popularity of tiny homes is surging across the country. 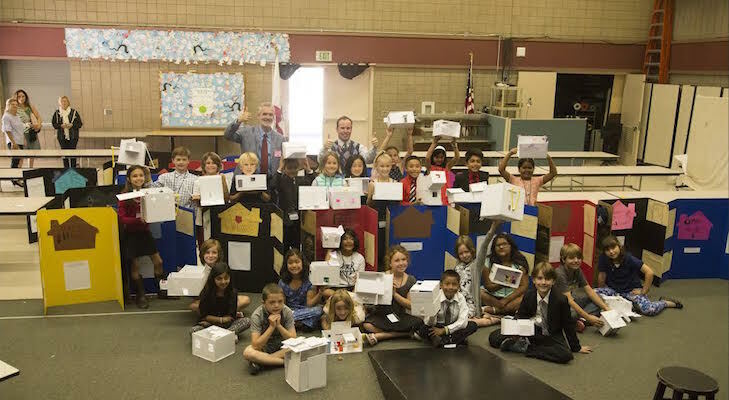 Mr. Regan’s third grade class was very enthusiastic to bring the tiny home movement to Santa Barbara.